One of the coolest things about being back at sea level is hot coffee. Water boils at around 180F degrees at Snowbird, where the altitude is 8500 feet at the base, so coffee cooks away in my trusty Moka machine, but it’s not really hot. Food can actually burn on the stove, but not even be close to being cooked, so it can be an exasperating experience to try and turn out a meal. 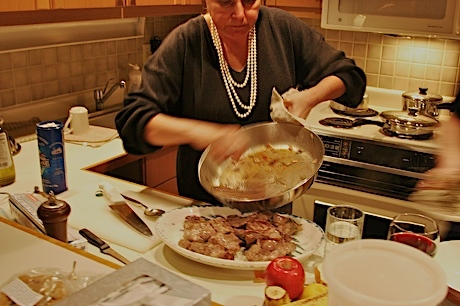 One of our last meals was a Franco-Italian version of lamb scotto ditto. 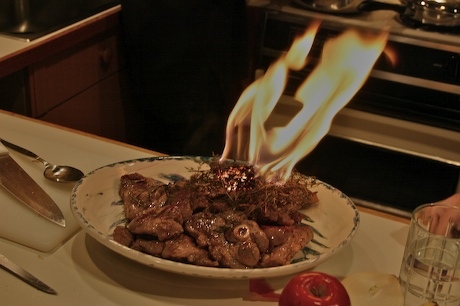 Scotto ditto is an Umbrian style lamb dish where thin slices of lamb are quickly seared on the grill and you eat them with your fingers while they are scorching hot. Scotto ditto literally means burned finger. We don’t have a grill in Utah, so we used the stovetop, and then used a French technique where you burn dried branches of thyme over the meat and let the thyme ash scent the room and flavor the meat. Besides, it’s big fun to light a fire on top of your dinner, just be sure not to do it near a smoke alarm. If you want to do the scotto ditto thing, get your butcher to slice some lamb shoulder as thin as possible. If you are laughing at the idea of getting a butcher to cut anything, then either track down a good butcher or look for the thinnest possible cut of lamb you can find. An hour or two before serving generously salt and pepper the meat and layer it with fresh rosemary and bits of garlic. Sear on a hot grill or in a pan and serve. It’s that simple. If you use the indoor pan method you can also deglaze the pan with a bit of red wine and pour over the meat. If you want the full flame effect, coat a good quantity of fresh thyme with some scotch or bourbon and dry the thyme in the oven. Lay the dry thyme on the meat, start the bonfire, let the thyme reduce to ash and then eat those lamb bits before they get cold! We had a great month with lots of fun visitors and plenty of snow and laughs. I’m already looking forward to next year. And Kevin….hope you aren’t too lonely! We’re missing you too!